Standard Coil & Coilguard Heavy-Duty Coil Rack. Portable Racks for coiled strip provide fast, efficient, low-cost handling. They are engineered for dependable and maintenance-free storage. May be loaded to capacity with a ramshorn lift truck or "C" Hook. When loaded, they are handled as unit loads, with 4-way accessibility by forklift truck. 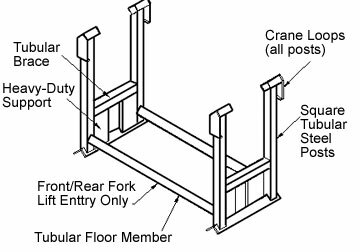 At a slight extra charge, racks may be provided with "Hook Slots" for handling with overhead crane in conjunction with a 4-Point Grab. Store coil diameters from 24" through 42"
Standard Coil Rack capacity of 6,000 lbs. Available in 6 different widths from 20" to 42" and 5 different heights from 34" to 72"
These racks handle 48" to 60" diameter coils and offer a unique nesting feature to maximize maneuverability.